At the tail end of 2018, the World Health Organisation (WHO) published a detailed report on the perennial issue of road safety. According to the numbers published, every 24 seconds somebody dies on the road. To sensitize the public to the issue, the WHO has created a report data visualization page where we can actually see just how frequently a road users dies in the world as it ominously countdowns the average time between fatalities and adds it to the growing total. Effective speed management is, as such, central to most road safety intervention strategies. Regarding the WHO report, some countries still need to focus on the best practices when it comes to setting appropriate national speed limits. In your fleet make sure speed limits are respected to reduce the possibility of collisions and that you manage a responsible pool of drivers. Drink-driving. The best advice is never ever drink and drive, even if there is a BAC limit provided. 5–35% of all road deaths are reported to be alcohol-related. Make sure you have a drink driving policy or set frequent reminders, particularly during sensitive periods. Seat-belt use. Wearing a seat-belt reduces the risk of death among drivers and front seat occupants by 45–50%, and the risk of death and serious injuries among rear seat occupants by 25%. Make sure your drivers use seat belts. The other two areas of safety focus, not particularly applying to fleets but to road users generally, are the use of motorcycle helmets and of child restraints. 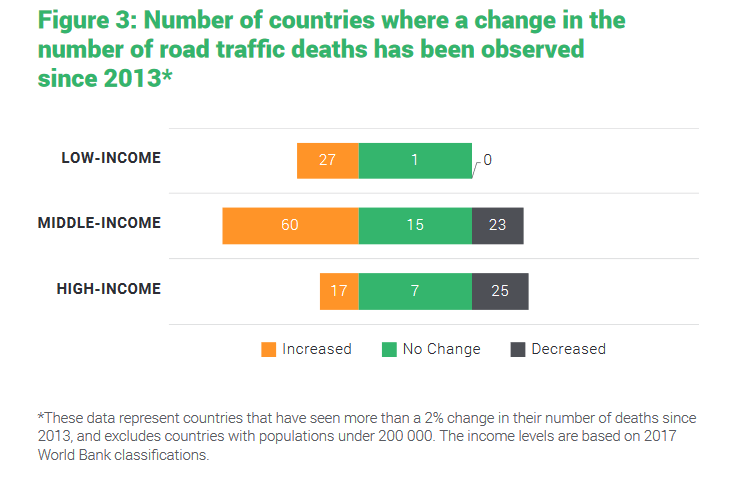 Considering the uncomfortable statistics regarding global road safety, it is extremely important to act now or the SDG target will not be reached by the 2020 deadline.